Using the dominance of degree granting power to protect a Universities future is like defending Corregidor. At best, it's a holding action. At worst, it's a deadly distraction. Corregidor, as viewers of The History Channel will know, was the Gibraltar of the Orient, protecting Manila Bay, the best natural harbour west of San Francisco, and with it, the Philippines and Americas empire on the Pacific rim. A magnificent fortress, it was thought to be able to withstand siege for six months, plenty of time for the fleet from Pearl Harbour to relieve it at leisure. Within a few minutes at Pearl Harbour, with that fleet in ruins, Corregidor's fate was sealed. It indeed fell six months later, after a long a bloody battle which tied down substantial Japanese forces. Few of the defenders lived to see VJ day. The degree granting power of Universities is indeed a fine fortress. Degrees hold vast power over the imagination of the middle classes, a magic scroll, held like a wand by a robed graduate, to open the door of success and respectability. They provide employers a handy shortcut to assess the diligence and knowledge of potential hire. They are difficult to earn, thus filtering out students without the brains, resource and good fortune. A degree is a valuable thing. It's a good business to be in, making graduates. If you are an academic and don't think education is a business, the next Pegasus back to Fairyland leaves at four. it might not be a for profit business, but students, or taxpayers on their behalf, spend a heap of good money to get graduates. It's a transaction. That makes it a business. If you don't think it should be a business, do it for free. There three big barriers to entry for a potential competitor who might try to get into the graduate making line. First, the brand. The University of So and So has been around for a long time, and will have build up a certain reputation among employers and potential students. It takes a long time to build that up. If I decided to open a university in the morning (The University of Rob), however good it was, it would still take me years, and a vast expenditure or marketing and public relations propoganda to build that brand. Potential students are often steered by parents and career guidance teachers who'll be a clear quarter century out of touch. Employers are more fickle, but still lean on degrees from places they've heard of to filter the candidates into the slush pile. The brand (or, reputation, if you don't like commercial language) is the most valuable asset a University has. Second, the infrastructure. The conventional degree setup is expensive to run. Lecture halls must be maintained, academics fed and watered, quads mowed. Students spend four years knocking about the campus jumping through one hoop or another, and that costs money. So long as people expect a degree to look like four years physical time on campus, it's going to be expensive to do that. If I wanted to open a university in the morning, I'd have buy some expensive real estate, do a lot of building work and hire a great many academics. I can't just put up lots of content on Youtube like the Khan Academy and expect people to take me seriously, no matter how good my material is. Finally, there is the state sponsored monopoly. The state reserves the power to decide who can and cannot hand out degrees, or even who can call themselves a University. The University of Rob would soon find it's letterbox full of troubling legal correspondence. This is the weakest link.One keen populist or neo-liberal politian, one piece of legislation, and it's gone. If I ran the circus (after the Revolution, you know) I would sweep this away with the stroke of a pen, just to see what would happen. First up, a whole bunch of private providers would ride over the hills. Most of them would be cowboys. The natural reaction would be to put some kind of bureaucracy in place to regulate exactly what size chunk of cognitive transformation a Batcholers, or Masters degree is (How would we measure congnitive transformation, exactly?). Adding quality assurance system is tempting, but why not just let people get their learning in module (or smaller blocks) and have graduates and employers rate how useful each unit was. Things like Tripadvisor work fine for a weekend in a hotel, which is about as long and expensive as a single module might be. Cowboys with turkey courses would soon find themselves on the receiving end of poor reviews and hard pressed to win further business. Existing institutions may find some surprises, good and bad, in the cold light of day. Students could go as they please, learning what they need, wherever it is best, where and when they need it. Employers might learn they don't care so much about the broad education, they want people who have done this or that unit. Newspaper commentators may feel it undermines society. Society is of course, not prevented from subsiding the process, just as it does today. Universities shouldn't rely on their degree granting power to survive, no more than the defenders of Corregidor could rely on the Pacific Fleet. A state sponsored monopoly is no secure long term foundation for any enterprise, especially in a time when other changes have the potential to strongly erode the incumbents position. Alas, the Tertiary Sector will have no Pearl Harbour. The Edupunks shall not fly over the hill one day yelling Banzai, to wake Universities from their complacency. The collapse will come slowly, as first two planks of their value wear away, decade after decade, until they rest more and more on the monopoly of degree granting power. That too, will in time become irrelevant. 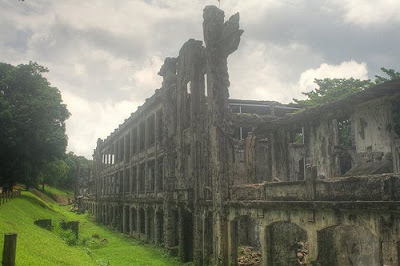 Corregidor was eventually retaken, of course, in a war that ended using tactics and technologies unimagined when it was constructed. It was not rebuilt. Photo: Ruins at Corregidor, by Jepster via Flickr.